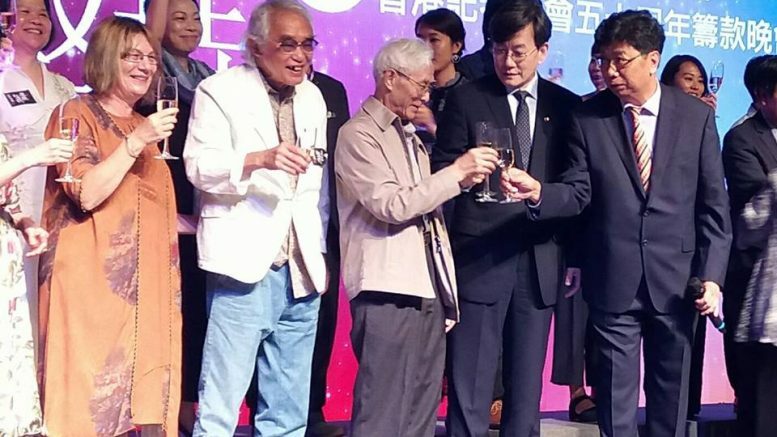 HKJA office-bearers propose toast with Sohn Suk Hee (second from right on front row), head of news department of South Korea's JTBC, and veteran photographer Chan Kiu (middle) at 50th Anniversary Gala Dinner on May 19. 51 years ago, several reporters were injured when they were attacked during their reporting work on the 1967 Riots. To fight for the rights and benefits of reporters, the Hong Kong Journalists Association (HKJA) was set up in 1968. In the wake of the 1967 Riots, the British Hong Kong colonial government had changed their ruling strategy, embarking on major social and economic transformation and livelihood reform. Beginning from the 1970s and 1980s, the Hong Kong economy started to take off. The Sino-British Joint Declaration. Basic Law. June 4. 1997 Handover. Asian financial turmoil. Sars (severe acute respiratory syndrome). July 1 rally. Umbrella Movement… Hong Kong had undergone “great times” one after another in the past half a century. One generation after another, reporters stood at the frontline of history, watching and reporting the unfolding of events. In times of historic changes, reporters, both as individuals and as members of the media profession, could not stay aloof from the changes. We are confronted with shocks from all directions in the midst of sea changes around the globe – and the good times and bad times of the city under the “one country, two systems” political framework. 50 years on, our task in defending the “fourth power, playing the role of watchdog and fighting for their reasonable rights and benefits has become increasingly arduous. There is no sight of an end of the chilly winter. The wind turns gustier. Bracing against the wind, it is not easy to stand firm, let alone moving forward. Behind us as we move forward are young students who are aspired to join the fleet of reporters and frontline reporters, some of whom facing pressure from their parents who want their children to go for something else. Behind us are our China-beat reporters, who want to tell the true China Story without fear and regrets despite the increased hostilities and violence by the public security officers on the mainland. Behind us are senior journalists, many of whom with more than 10 years of experience, but earning less than what a fresh university graduate who joins the Police pockets each month. Behind us are news editors who persist despite having to work long hours every day, shepherd fresh reporters while having to play mind games with their management on matters ranging from the handling of sensitive news to the allocation of manpower and budget. Behind us are gatekeepers, many of whom still have passion, belief and commitment to journalism but have to play brinkmanship on a daily basis. Behind us are also You. Your presence at our Gala Dinner tonight is a show of support for us, and more important, for journalists and for independent fourth power. It is a backing for us to keep finding out the truth, unearthing injustice and unfairness in our systems and society in the spirit of professionalism and fearlessness. We long for changes. Changes for a better society. Behind us as we go forward against the wind are the people. We understand our media have not done our job well; we can do better. Hong Kong people have mixed feelings towards the media. Many of them criticised us as they read and watched news. Why? It is because they still believe society cannot afford to lose media, which keeps staying independent, daring to criticise, telling the truth and making dissenting voices. We cherish and hope our journalist colleagues will not let you and the people down. Recently, journalist friends have asked me about the question of unemployment protection for reporters. They fear about job security and what if media companies decide to cut costs by laying-off staff and off-sourcing work. With better protection, those who are aspired to become journalists and working journalists who remain passionate about journalism would feel more secured staying in journalism work. Hong Kong is a market-oriented capitalist economy. Media is business. Media owners need to operate from a commercial perspective. Call it the rule of survival. But media is not just business. A healthy, dynamic, lively and pluralistic media can monitor the society against injustice. This is vitally important to the overall long-term development of the society. We sincerely hope that media bosses will not treat their media as mere business and that they will think big on their media outlets’ importance to the society’s future development. Regardless of the difficulties they may encounter, face them up and persist together with their reporters. Starting from 2013, we have joined hands with academics to conduct an annual survey, entitled Press Freedom Index. The latest results for the past year were announced in April. Out of 100, respondents in a public poll gave a score of 47.1, 0.9 point down from the previous year, which is the lowest figure since 2013. In a separate poll, journalists gave a score of 47.1, up by 0.9 point. But it is still below the 50-point Pass level. Asked to compare the present press freedom situation with the previous year, 73 per cent say it has turned bad. Survey found most of the journalists and public who responded attributed pressure from the Chinese central government as an important factor that has undermined press freedom. The results are not surprising. Over the past year, the Chinese central government has repeatedly emphasised the notions of “one-country overriding two-systems,” “comprehensive jurisdictions over Hong Kong” and the “red line” and “bottom line” under “one country, two systems”. Journalists and the public are increasingly worried about the preservation of “two systems”. They fear that media bosses, who have intricate ties with the mainland authorities, would become “harmonised.” Fearful of provoking Beijing and creating trouble, media proprietors might practise self-censorship when handling stories that are politically sensitive. There have been occasional cases of stories that touched on sensitive issues relating to the central authorities being allegedly withdrawn or censored. Some are difficult to prove or disprove. With almost no exception, they have fuelled jitters that the room for free press and free speech is shrinking. The overall atmosphere has been suffocating. When legislative work of Basic Law Article 23 will resume is still unclear, not to mention how. But in the wake of remarks by Beijing officials that the negative impacts of a delay in the enactment of an anti-subversive law are clear and that Hong Kong is obliged to do so, journalist and society feel the issue is now at their doorsteps. To HKJA, 2018 is a special year. We have embarked on our journey for half a century. To journalists, 2018 is perhaps not something special. As it was in the past, we have not forgotten our original intention. We have not forgotten the wise words from a veteran American journalist, “The press was to serve the governed, not the governors.” There is a traditional Chinese saying, “At 50, know the destiny.” The destiny and mission of journalists is to be a watchdog. Bark when there is injustice. Bite for the truth. The media environment keeps changing everyday. It was the case in the 60s and thereafter. It will remain so in 2018 and the future. Unchanged the mission and destiny of journalists are. HKJA is the largest journalists’ labour union in Hong Kong We stand at the frontline of history fighting for the reasonable rights and benefits of journalists, improvement of work conditions and enhancement of professional standards. More important, we fight for freedom of the press and freedom of expression. This is because powers must be given checks and balances for them to be exercised wisely and properly without abuses for the best interests of the society. Journalists will lose their soul and not be able to monitor the authorities if there are curbs on free speech and free press. We have stuck to our goal and mission, work direction in the past 50 years. We will continue to do so as we look forward to the next 50 years. Bracing against the wind, we move on with a warm heart. This is the full version of the speech given by Chris Yeung, Chairperson of the Hong Kong Journalists Association at its 50th Anniversary Gala Dinner on May 19, 2018. An abridged version was delivered at the dinner. Chris Yeung is also Chief Writer of CitizenNews. Be the first to comment on "Brace against the wind with a warm heart"